Talmudist; lived in Gerona in the twelfth century. 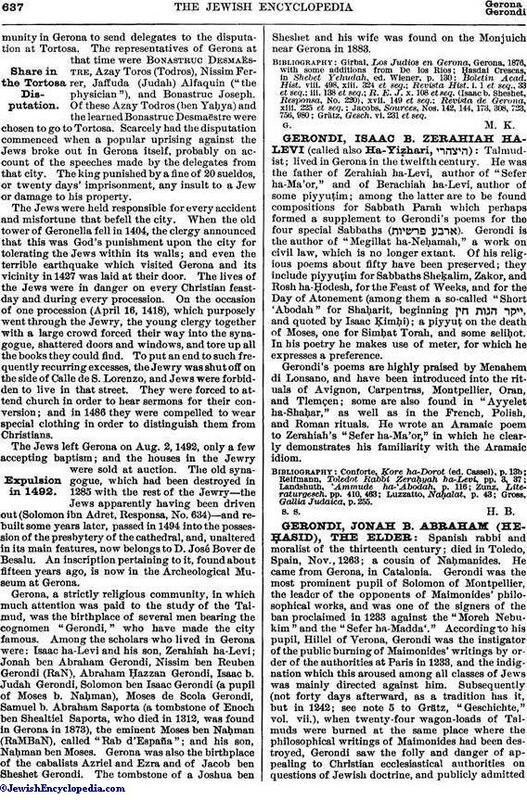 He was the father of Zerahiah ha-Levi, author of "Sefer ha-Ma'or," and of Berachiah ha-Levi, author of some piyyuṭim; among the latter are to be found compositions for Sabbath Parah which perhaps formed a supplement to Gerondi's poems for the four special Sabbaths ( ). Gerondi is the author of "Megillat ha-Neḥamah," a work on civil law, which is no longer extant. Of his religious poems about fifty have been preserved; they include piyyuṭim for Sabbaths Sheḳalim, Zakor, and Rosh ha-Ḥodesh, for the Feast of Weeks, and for the Day of Atonement (among them a so-called "Short 'Abodah" for Shaḥarit, beginning , and quoted by Isaac Ḳimḥi); a piyyuṭ on the death of Moses, one for Simḥat Torah, and some seliḥot. In his poetry he makes use of meter, for which he expresses a preference. Gerondi's poems are highly praised by Menahem di Lonsano, and have been introduced into the rituals of Avignon, Carpentras, Montpellier, Oran, and Tlemçen; some are also found in "Ayyelet ha-Shaḥar," as well as in the French, Polish, and Roman rituals. He wrote an Aramaic poem to Zerahiah's "Sefer ha-Ma'or," in which he clearly demonstrates his familiarity with the Aramaic idiom. Gross, Gallia Judaica, p. 255.